I found it extra difficult this time to select nine poems – not because the chosen ones aren’t brilliant, they most certainly are – but because there were so many others that ‘came close’, that demanded to be noticed. I started making a list of them to be included in this report but in the end decided not to because there are many. A number of poets used the technique of line end rhyme. This, I think, is incredibly hard to do well. So often the chosen rhyme is not the best one – it may sound alright and be pleasing to the ear but may not be the best word to convey meaning and emotion. Poems that worked best in this competition, where the poet was keen on using rhyme, was where enjambment reduced the doggerel effect or where the rhymes were ‘looser’ – as in several of the sonnets which I found very effective. A number of themes recurred throughout the entries. Many concerned personal experiences, families, relationships, the pain of love and loss, assumptions, hope and disillusion. Memory was a strong theme, collective memory and connections with the past as well as the individual and present. Many strong poems described landscape and the natural world and there was an emphasis on Earth as unsustainable, under threat. Imagery conveyed strong feelings and profound thought in poems about war, sickness and malignancy. This competition brought me a bagful of poems rich in variety and complexity. Here, after a lot of thought and indecision, is my selection. An outstanding poem. Comes into my personal category of ‘I wish I’d written it!’ Intriguing and highly original it takes the idea of having a jumble of words and thoughts from a medieval battlefield somehow ‘recorded’ in an ‘old technology’ and left for us to decipher and interpret if we can. The Battle of Towton was one of the most ferocious of the Wars of the Roses, lasting ten hours in a snowstorm so that the white ground afterwards was stained for miles with blood. An idea close to my heart, this connection of the past with the present, the idea of atmosphere and vibrations being forever contained in objects and settings. This poem, however, goes beyond that. To me it reads as all wars, all atrocities. The horrors of Towton are echoed in the trenches, in the rubble of Syria. An incredibly profound poem which leaves us with desperate questions and pleas: ‘surely someone will listen?’, ‘Are you hearing any of this?’, ‘it may matter/ someday, they may need to know it’. Quotation and commentary cannot do justice to this brilliant poem that uses language so skilfully and to the full. The poet, on a chilly day, is looking at clouds, blows on his fists to warm them and feels ‘the scrunched membranes/that mesh my fingers/and remembers how ‘pterodactyl/means finger-wing’. From this imagery of membranes and bones other associations come fast – the poet notices ‘the sludgy hulk of a decomposing pigeon’, remembers how his/her grandmother was ‘bird-bone hollow, all ribstrakes and wing-scaffold … knuckly birdleg fingers.’ There are further incredible risks with language: the granny’s cremation is described lyrically as ‘plume-cinder ash…The south-easterly hush-hushed it north’, but then we have a line of harsh consonants ‘I interred the pigeon’s slimy reek in a skip’ followed by the quotation ‘le fruit de vos entrailles est béni’ – a direct reference to the Annunciation, a miraculous birth in contrast to this imagery of death and putrefaction. This is another poem that stayed with me from the first reading. 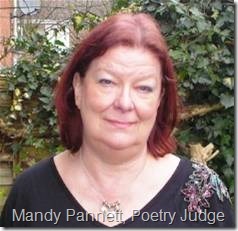 Maybe there are underlying themes – identity, awareness, selection, discrimination, even sacrifice – but I chose this poem for its humour, detail and the perfect ‘voice’ of it whereby the ragged quince on a tree in an apple orchard is personified with ‘warty limbs’ and begs the onlooker to pluck it from the tree so that more fruit may grow. The language is conversational and colloquial but with a lyrical Shakesperian touch – ‘a summer comes’ says the quince, ‘oh ,pluck my fruit,/at night the stars smile through me.’ An irresistible poem. The narrator in this poem has been ‘camping/in a strange land’ where, for days, there has been ‘a sopping mess’ of ‘rain and thunder, wind whipping leaves’, where even the chipmunks have been ‘washed out their burrows’. Now the sun is out and an assortment of people gather for the celebration. A delightful poem which I chose for several reasons: its effective use of enjambment, the clear and detailed imagery – I particularly love ‘a silver oven/waiting, for the body of a hog to be spun in its space/like a planet too close to a star’ – but most of all for the small, ordinary, incidental aspects of the day: the names of people and places, phrases of overheard conversation, the baked potato ‘still hot in its aluminium wrapper’, the red-haired brothers licking sour cream ‘from their white plastic forks’. Pleasure on this day may be transient but while it lasts it is real and good. I must confess to a touch of subjectivity here as a poem that ‘plays’ with language and uses techniques of circularity, reversal and repetition will always catch my interest. When it is crafted as beautifully and skilfully as ‘Mobius’ it is guaranteed to find its way on to my winners’ list. Here the poet uses the metaphor of a dance to create the ‘infinite loop’ of a courtship with its spiral of resistance, pursuit, delusion, hopes, tears and dreams culminating in ‘the joining of edges’ as the couple ‘cut loose and flew/Dancing.’ A clever and memorable poem. I find this sonnet incredibly moving. An adult remembers himself as a child playing at being a priest. Here ‘a patterned hearthrug’ served as a church, the swing of the censer could be mimed, the altar was a shoebox with ‘pencils stuck in cotton-reels for candles.’ This was a vulnerable child searching for something beyond the tangible and inarticulate and this is a vulnerable adult too, still yearning, still on the quest for something more, for an ‘Everywhere’. An incredible poem that suggests so much in a few lines.